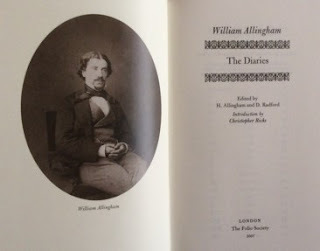 I was reminded of William Allingham the other day because he was the ODNB life of the day. The Fairies was one of my favourite poems when I was a child. As you can see, it was in my school reader (I must have been bored at some stage because I've coloured in the mountain) & I can still remember phrases & images from it all these years later. The crispy pancakes of yellow tide-foam fascinated me & the fate of little Bridget, stolen away for seven years & dying of sorrow, was a frightening thought at the age of about nine. The third verse below isn't in my school reader version, probably because it wouldn't fit neatly onto two pages. 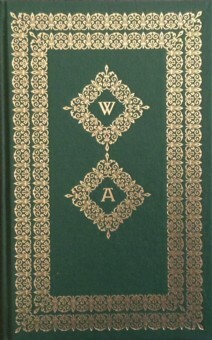 I've also had Allingham's diaries on the tbr shelves for a few years in this lovely Folio Society edition. He was born in Ireland but lived in London for some years with his wife, Helen, who was a popular watercolour artist. He knew Tennyson, Rossetti & Burne-Jones so I really must get to the Diaries one of these days. He 's nigh lost his wits. I don't know his work at all, but I'm a huge fan of his wife's paintings. The Fairies is his most famous poem but he was well-regarded in his day.. I like Helen's work as well.